This canvas by the French painter Louis Ducis, with its precise contours, refined finish, clear colors and ordered composition, sums up the ideals of neoclassical painting. 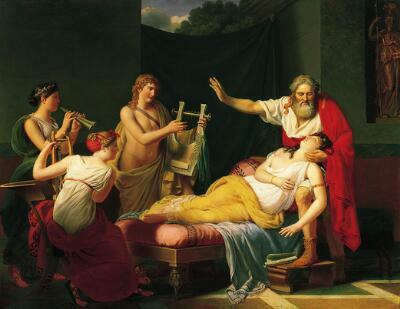 It recalls an event in the life of Sappho, one of the few known female poets of the ancient world. Born in Greece in the early 6th century BC, she had fallen desperately in love with a young man named Phaon. Failing to gain his affections, she flung herself off a cliff in the hopes that a “Lover’s Leap” would cure her hopeless passion. Here, she is brought back to life by the magic of music. An accomplished composer, Sappho wrote her poems to be accompanied by a lyre, here played by a beautiful, almost naked youth. A scroll has dropped from her hand… a fragment of her famous poem in praise of the elusive Phaon. A renewed interest in the art of classical antiquity had been spreading throughout Europe since the mid-18th century, prompted by the discovery and excavation of the ancient cities of Herculaneum and Pompeii. Its values fit in perfectly with the ideals of the French Revolution, and neoclassical painters like Ducis found their themes in tales of high ideals and civic virtue.